A thousand years ago, a unique spiritual adept traveled the Americas. He wore a white tunic with a red Celtic Cross woven into the cloth. He became a legend in Central America as Quetzalcoatl, in South America as Amaru and the Sha Na Ah, or guardian of his wife White Buffalo Calf Woman, in North America. In Europe, he was a Scottish prince who had access to the true legendary Stone of Destiny and not the fake one that was given to the English and is now displayed in a museum. The real Stone of Destiny is a unique Teraphim, one of the Pre Great Flood artifacts of Thoth Hermes Trismegistus and it is a storehouse of ancient information. The Stone of Destiny is mentioned in the Bible where the Sumerian Hebrew Jacob, (who after completing the 14 years of the Eye of Horus Mystery Schools), was able to access information in the Stone of Destiny. This is the esoteric wisdom behind the Bible’s fictional story of Jacob arbitrarily selecting a stone to use as a pillow and dreaming of Angels. And so it was that the Scottish prince received a download of information stored in the Teraphim by Thoth Hermes Trismegistus, and the man people call Jesus. In this way, he learned about the location of the Ark of the Covenant containing the priceless treasures of Thoth Hermes Trismegistus and documents from the one people call Jesus. As explained to participants during a series of our Weekly Love Fests, when the young Scottish prince located the Ark of the Covenant, he knew the information, artifacts and wisdom in the Ark that came from Thoth Hermes Trismegistus and the one people call Jesus so conflicted with the fictional stories recorded in the Sumerian Hebrew’s and Egyptian Hebrew’s Old Testament as well as in the Roman Emperor Constantine’s New Testament that the Roman Empire’s Church would immediately destroy everything in the Ark and kill all family members of anyone who knew anything about the Ark. And so it was that as a young man he reburied the Ark of the Covenant and took only a few artifacts back with him to Scotland. However, these few artifacts changed the course of human history, as his relatives used the artifacts to create the Knights Templar and Cistercian monks organizations. 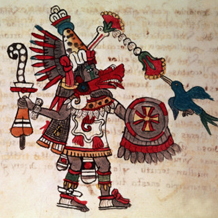 Quetzalcoatl’s relatives in these 2 organizations would later secretly move the Ark of the Covenant first to France and 3 centuries later in the early part of the 14th century to Scotland. The Scottish prince used maps from the Ark of the Covenant and traveled by boat with family members to the Americas, landing in what is called today, Rhode Island USA. Then, he and his group traveled south and with his information and artifacts from the Ark of the Covenant, he and his teachings became legendary in North America, Central America and South America. As explained in our Ga Ra and Za Ra’s Legendary Adventures recording, Quetzalcoatl and his wife White Buffalo Calf Woman enjoyed many spiritual adventures when they visited upstate New York’s Finger Lakes District a thousand years ago. Listen to the proper interpretations of New York’s Native American Aboriginal legends regarding the ancient historical events they explained a thousand years ago to the Mound Builder Aboriginals.